Please refer to our stock # 158 when inquiring. 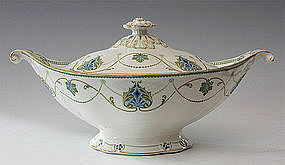 Oval tureen having green garland borders and sides with raised volute scrolls terminating beneath gold embellished volute handles. The elaborate decorated cover crowned by an intricate gold-highlighted finial handle (see enlargement #5). Mark on base: Royal Stafforshire Pottery Burslem England. Circa 1920. Size: 13.25" (handle to handle) x 7.375" W x 6.625" H.